The iconic U.S.S. 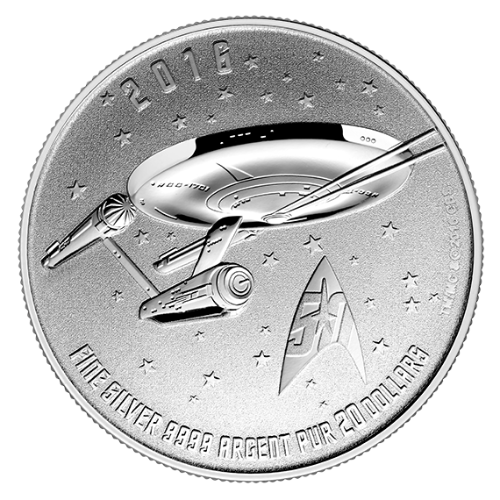 Enterprise is the first coin in a new 11 coin Star Trek series being issued by the Royal Canadian Mint to celebrate the 50th Anniversary of the highly acclaimed television series Star Trek. Officially endorsed by CBS Studios, this 2016 Canada Silver Proof Star Trek Enterprise coin is a limited mintage of 300,000. The coin has a face value of $20 dollars, is 1/4 Troy oz. of .9999 fine silver, and measures 27mm in diameter. The reverse portrays the mighty Starship Enterprise surrounded by stars engaged in battle, firing its forward phasers towards an unseen enemy threat. Klingons, perhaps? “50”, within the classic Star Trek insignia, appears to the right. Inscribed in the classic Star Trek font are: “2016” and “FINE SILVER .9999 ARGENT PUR 20 DOLLARS”. The obverse depicts the profile image of Queen Elizabeth II designed by artist Susanna Blunt. Inscriptions are: “ELIZABETH II”, and “D. G. REGINA”. The uncirculated 2016 Silver Star Trek Enterprise GEM Proof coin is beautifully presented in a sealed fold open package as originally received from the Royal Canadian Mint which includes a Certificate of Authenticity. This specimen finish Silver Proof coin is extraordinarily detailed with a mirror-like details. Collectors and will appreciate the exquisite craftsmanship of this Silver Proof dedicated to the iconic Starship. Boldly add this Silver Proof Star Trek Enterprise to your collection, or present it to your favorite Star Trek fan.